Cincinnati Council Member David Mann wants to designate the former Terrace Plaza Hotel as a local historic landmark. The Terrace Plaza Hotel in downtown Cincinnati has been closed for more than a decade. But there's a move underway to designate the building as a local historic landmark. Council Member David Mann is asking a city board to approve the designation. Mann said he doesn't want to stop redevelopment of the property, but to make sure any plan respects the building's historic integrity. "If this is going to be redeveloped, if it's going to be redeveloped with public support, and either way listed or not, you can be sure there will be some request for public funds," Mann said. "That redevelopment, that use of public funds ought to respect what the significance of this building is." The facility is also listed on the National Register of Historic Places. 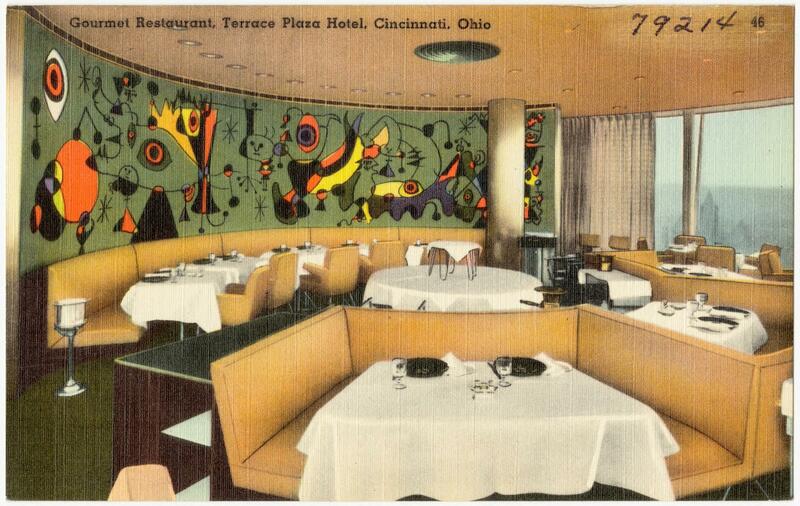 A circa 1930-40 postcard featuring The Gourmet Restaurant at the Terrace Plaza Hotel. If the local historic designation is granted, potential developers would have to consider a plan to preserve the building's historic integrity. Paul Muller with the Cincinnati Preservation Association says that could have financial advantages. "To make it a historic restoration is really important economically," Muller said. "Because if it is not historic we immediately lose historic federal tax credits, which are 20 percent of the project cost. And the potential for Ohio tax credits, which are 25 percent. So that's 45 percent of the project costs that could come to this project in subsidy." The city's historic conservation board will consider Mann's application. After that, it would need approval from the planning commission and ultimately the full City Council. That process could take about six months to complete. Read Mann's full proposal below. An anchor building of Fountain Square has a new owner. Cincinnati Center City Development Corporation, 3CDC, is purchasing Fountain Place for $7.5 million. The building was home to Macy's Downtown store, Tiffany's, and the restaurant Palomino until last year.